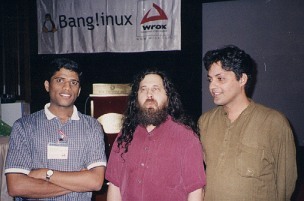 During the “Bang!inux” Linux Conference held here in Bangalore in February 2000, my friend Ananth Chandrasekharan and I managed to get RMS (Richard Matthew Stallman) to pose with us for a photograph. He kept saying “The movement is more important than the individuals!” (or something to that effect) as he posed for this, while we were just too excited to see the “hacker of hackers” in person and to be able to listen to him talk, to pay attention to that. Yesterday I watched “The Matrix Reloaded” for the second time in two weeks - this time around a LOT of the dialogues made so much more sense in the light of what the Architect tells Neo towards the end of the movie that I remembered from the first viewing. I still could not understand why some rather tautological statements like “Some things never change - and some things do!” had to be repeatedly uttered by Niaobe and Morpheous. This movie demands repeated viewings to be able to make sense of most of what is revealed and you still do not know whether your interpretation and hypotheses are “correct”! No wonder it has been analysed so much by so many people. I was intrigued so much by this movie that I have ordered the Animatrix DVD from amazon.com to get as much background information as possible! It was wonderful to see Warner Brothers release this movie here in India within a month of its release in the US! I hope they keep it up for the sequel to this movie that I am, needless to say, dying to see. By the way, did you know that I also maintain a sort of a geek diary?